Barcoding Frequently Asked Questions (FAQ) - The Barcode Experts. Low Prices, Always. See our help section for information about BarcodesInc ordering and policies. Do I need a UPC number? How do I get a UPC number? How much does a UPC number cost? What is a UPC barcode? Can I print my own UPC barcodes? A barcode essentially is a way to encode information in a visual pattern that a machine can read. The combination of black and white bars (elements) represents different text characters which follows a set algorithm for that barcode type. If you change the sequence of elements you get different text. A barcode scanner reads this pattern of black and white that is then turned into a line of text your computer can understand. Is the price of my item in the barcode? A barcode can hold any type of text information you encode but with product labels the price in not usually encoded. The barcode will denote what product it is and your POS software or database will have pricing information associated to this. What is a 1D (linear) barcode? What is a 2D barcode? A 1D (linear) code is the typical "picket fence" style barcode that people are most familiar with. There are several versions of 1D codes and some encode only numbers while others can encode any keyboard character. All the information in the code is organized horizontally from left to right. These types of codes can be read by any type of barcode scanner. 2D barcodes are a bit more complex as they organize information vertically and horizontally. This allows 2D codes to hold much more information and take up less space than a 1D code. 2D codes require an imager scanner to be read properly. How many characters can fit into a barcode? Depending on the specific barcode type, 1D barcodes can have from 20-25 characters while 2D codes go up to 2,000 characters. The main practical concern is that as you increase the amount of information in the barcode the bigger it will become. This is especially the case with 1D barcodes and in use most people encode 8-15 characters. What is the barcode on a driver's license? In the United States, driver's licenses use a PDF417 stacked 2D code. How small can I make a barcode? Barcodes can come in a wide range of sizes and can get down to a 1/8th inch square when using a 2D code. However, there is a trade off since making such a small code will limit the amount of characters you use and will require a high resolution label printer to ensure the quality of the print is still readable by a scanner. The smaller a code becomes the more difficult it is to read. 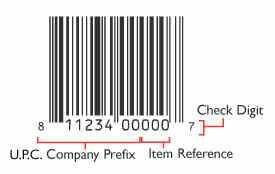 If you sell products to a distributor or a retailer, you will typically need a UPC barcode. If you are not sure, it is best to contact the company selling your product to find out their policy on UPC barcodes. When you obtain your UPC number, you will also get a certificate authenticating your number. Most retailers require proof of the certificate to verify that your number is unique and authorized. Only GS1 US can issue you a globally unique "GS1 Company Prefix" that is used to create UPC numbers. The fee is determined by the number of unique products you need to identify and as well as gross sales revenue. Because the prices vary so greatly, only GS1 can give you an accurate cost for this. The UPC number itself is referred to as the GTIN (Global Trade Item Number). The GTIN is made up of two parts: The UPC Company Prefix and the number that you have assigned to that unique product. This first component, the UPC Company Prefix, is between 6 and 10 digits long, and is assigned to you by GS1. The number of digits is determined by how many products you will need to assign numbers to. So if you have thousands of products, your company prefix will need to be fewer digits. If you have just a few products, your company prefix will likely be closer to 10 digits long. This company prefix number will represent you as the manufacturer on all of your products, as well as in any EDI (Electronic Data Interchange) applications. The second component is your unique number used to reference a specific product. It is called an "Item Reference Number." This number is not assigned by GS1- it is up to the manufacturer to assign the unique Item Reference Number for a given product. The last number is a check digit calculated from the previous 11 digits. It is not randomly assigned. The barcode label printing software you use to create your labels will calculate this check digit for you. You can contact BarcodesInc for help with selecting a label printing software to meet your business needs. Yes! Once you have your unique GS1 number, contact BarcodesInc for assistance with selecting a barcode label printer, barcode software, and barcode labels. What is the difference between direct thermal (DT) and thermal transfer (TT)? Direct thermal is a printing process that uses a label coated with a heat sensitive layer and does not use ribbon/ink to print. An image is burned into the paper where with thermal transfer you use a ribbon to print onto the label. Direct thermal will fade over time (aproximately 1 year) and is not a good choice for environments with higher temperatures or exposure to sunlight. Thermal transfer print is a more permanent solution and will not fade. DPI stands for Dots Per Inch and is a measure of a printer's resolution. The higher the number the finer the print will be. Most applications are suitable at 203 dpi but in cases where logos/images or very small labels are being made you will want 300 or 600 dpi. How many labels are on a roll? The number of labels per roll will depend on how tall the label is. The shorter the label the more you will get per roll. How do I make a barcode label? Once you have a barcode label printer and media you will need barcode label design software to create and print a label. In this software you can place barcodes, text, and images to fit your design requirements and then send the print job to your printer. A dispenser is an accessory feature available on most label printers that will peel the backing off of the label as it comes out of the printer. This is very useful for applications that will apply the label immediately after print since it saves time for the user. It can also be disabled if not needed. What is the difference between 'desktop' and 'tabletop' printers? Label printers are divided into two categories based off of their size and maximum print duty cycle. Desktop printers are smaller and best for low volume applications such as office labeling or a small retail store. Tabletop printers are meant for making hundreds or thousands of labels daily and are physically more robust to handle harsher environments. How does a barcode scanner work? A barcode scanner picks up the alternating black and white elements of the barcode which follow a specific algorithm that is turned into a corresponding text string by the scanner. This information is then sent over to your computer by the scanner no different than a standard keyboard does. This string of text will populate where ever your cursor is on screen at that time. Do I need any special software to use a scanner? Barcode scanners do not require any special software or driver to function properly. They will emulate a keyboard and will be recognized by your computer as a general input device. How far is the range of a cordless barcode scanner? The range of a cordless barcode scanner does vary by model but most units use Bluetooth (Class 2) technology and have a range of 33 feet. Some of the rugged barcode scanners will use Class 1 Bluetooth which has a range of over 300ft. Can I read a barcode off of a screen? In order to read a barcode off of a screen you will need to have a 2D imaging scanner as it processes images as opposed to reflected light. A standard laser barcode scanner will not be able to read anything from a screen. Is a laser scanner dangerous? Barcode scanners use a Class II laser which is not harmful to your body or eyes. How long is the cable on a scanner? Most barcode scanners come with a 6 foot cable but longer lengths are available for many models. Can my scanner read a 2D barcode? 2D barcodes do require a specific type of scanner called a 2D Imager. The common laser barcode scanner reads codes by reflecting light from the black and white lines of a barcode and since the laser is a single line it only reads horizontally across the barcode. An imager takes a picture of the barcode and analyzes this to decode the information. Since 2D barcodes data are organized vertically and horizontally only an imager can properly decode all the information. Does a mobile computer come with software? Similar to a regular computer, a mobile computer will have an operating system installed on it but not any additional software. There is a wide range of compatible applications you can install on a device for specific functions such as asset tracking, warehouse management, mobile POS, etc. 802.11a/b/g/n is a wireless communication protocol that is commonly called Wi-Fi. Units with this capability can access a wireless network just as a PC or laptop. How is Windows Mobile/WindowsCE different from Windows 7/Vista? The mobile operating systems are distinct from Windows 7/Vista and though they have a similar layout, applications for one will not be compatible with the other. For example, there is a version of Excel that will run on a Windows Mobile device but this is not the same software you have on your desktop PC. What does WAN mean? How are GSM/HSPA and EVDO different? WAN stands for Wide Area Network and is the wireless communication mobile phones use. In the United States we have 2 types of WAN technologies available: GSM/HSPA and EVDO. GSM/HSPA uses a SIM card and service is provided by AT&T and T-Mobile primarily. EVDO does not have a SIM card and service is provided mainly by Verizon, Sprint, and Alltel. Batch refers to collecting data on a mobile device and storing it into memory on the device. In this case you are not sending information in real-time on a network but rather storing data on the mobile device and later uploading it to a computer via a wired connection as one batch of data. Can I get online with a mobile computer? Mobile computers offer 2 ways to get online either with Wi-Fi (802.11a/b/g/n) or through a cellular provider's WAN (wide area network). As long as you are within the coverage of the network and have permission/service to join you can gain access to the Internet. What factors should I consider when buying an ID Card Printer? Volume: How many cards do you plan on printing? Printing Capability: Do you want to print on one side or two sides of the card? Printing Technology: Can your card have an unprinted border around the card or do you need "over the edge" coverage? Security: Do you need lamination for security and durability? Encoding: What technology do you plan on using with the ID card Magnetic stripe, SmartCard, or UHF RFID? Does my choice of printer differ based on card volumes? Yes. The cost and capability of a printer will change based on the number of cards you intend to print. Value – The most economical of the ID Card printers. With a limited footprint and scaled down capabilities, this printer is perfect for small printing jobs and jobs on-the-go. Printers in the category are perfect for print volumes under 1,000 prints. Standard – A step up in design and printing capabilities, this class of printer offers a reliable print output with a moderate footprint. Printers in the category typically can handle 1,000 – 10,000 prints and are perfect for small and medium businesses. Premium – The most robust printers in the industry. These printers tend to occupy a larger footprint and typically offer more options for lamination and printing technologies. Printers in the category typically can handle a volume of 10,000 – 25,000 prints and it designed for high volume and high security requirements. Do I need a single or dual side printer? What is the difference between Direct-to-card and Reverse transfer? Direct to Card is the most common card printing technology which heats a print ribbon beneath a thermal printhead. Color is transferred to a blank card, and the images have sharp edges, deep blacks and a full spectrum of colors. There is an unprinted border around the card as printing close to the edge can cause expensive printhead damage in DTC printers. Reverse Transfer is less common than Direct to Card and transfers an image to a retransfer film. This film is applied to the blank card which provides "over the edge" coverage and vibrant, durable print. Do I need lamination for my ID Cards? Durability: Lamination provides extra durability for standard ID Cards. Purchasing a printer with a laminating option is ideal for cards in harsh conditions/environments and situations where continual use provides excessive wear and tear on the cards. What encoding options do I have for my card? Magnetic Stripe: This type of card is capable of storing data on a band of magnetic material. The magnetic stripe (also known as swipe card or magstripe) is read by physical contact when swiped past a magnetic reading head. Contactless Smart Card: These contain a re-writeable smart card microchip that can process and store data. They communicate with a terminal via radio waves with a read range of up to around 5 in. Gen 2 UHF RFID: RFID cards store data that can be read through radio waves at wider read ranges (typically 3 to 10 ft.), allow multiple card reads at the same time and are extremely secure. What else do I need besides a printer? A printer by itself is only one piece of the entire solution. To complete the puzzle you will also need the supplies, software, and accessories for your printer. We offer a large selection of printer ribbons, ID Cards, software, and lanyards and badges for your solution. You can also let us take the guesswork out of the equation. We offer ID Card Systems which contain the printer, the software, and accessories for your ID Card printing needs. Please contact a sales representative to help find the right system for you.